When adding a tool to EditPad Pro's Tools menu, there are three pages of settings that you can make for each tool. If you are adding a console or text mode application to EditPad Pro's Tools menu, then you can instruct EditPad Pro to communicate with the application via the options on the "Standard I/O" page. By default, console applications read input from the keyboard and write output to the screen. On the DOS and Windows command line, you can use the less than and greater than symbols to redirect standard input and output. The command line "sometool <input.txt >output.txt" will cause sometool to read from input.txt and write to output.txt. You cannot use these symbols on the command line when configuring EditPad Pro to run a console application. However, you do have a variety of options for redirecting standard I/O on the "Standard I/O" page. If a tool expects data via standard input (i.e. it expects a DOS/Windows command line like "sometool <input.txt"), EditPad Pro is capable of sending either the current file entirely, or only the selected part of the current file. The current file is whichever file you're editing at the moment you run the tool by selecting it in the Tools menu. If the tool is a text-based console application that accepts input from the keyboard, anything EditPad sends to the tool's standard input will be processed by the tool as if you typed it on the keyboard. This does not work with graphical applications, since those do not use standard input to retrieve keyboard input. Before running the tool, EditPad Pro makes an internal copy of the text it needs to send to standard input. If the tool takes a long time to run, editing or closing the file EditPad is sending to the tool will not affect the tool's execution. Ignore: The tool's standard output will be lost. Select this option if the tool doesn't output anything useful to the screen, or if it's a graphical application that doesn't support standard output. Replace selected text: EditPad will replace the selected part of the file that was active when you invoked the tool with the tool's output. If there is no selection, the tool's output will be inserted at the text cursor position. This option is particularly useful in combination with the option to send the selected text to standard input. That way, an external tool can provide text processing functions not provided by EditPad Pro itself. Into message pane: EditPad will capture the tool's output into a separate pane. Since EditPad Pro has only one message pane, the output of any previous tools that was captured into the message pane will be lost. Choose this option when a tool outputs status or error messages that you want to inspect but not keep. The message pane supports syntax coloring. 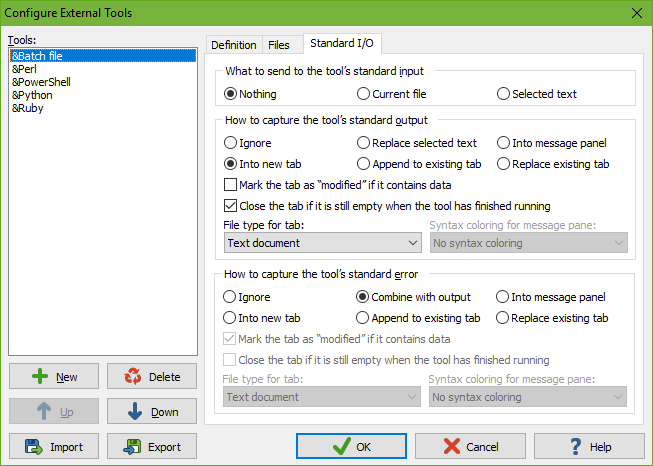 EditPad Pro ships with a few "Tool Errors" and "Tool Output" syntax coloring schemes that make the output of some popular tools a bit more readable. You can use the Syntax Coloring Scheme Editor to create your own schemes, or you can download schemes in the Colors and Syntax tab in the File Type Configuration. Into new tab: EditPad will create a new file tab to capture the tool's output. If you run the tool more than once, a new tab will be created each time. Select this option if the tool outputs a lot of data or a complete file. You can edit, save and close the new tab like any other file you'd edit in EditPad. Append to existing tab: EditPad will create a new tab to capture the tool's output, and continue using that tab each time you run that tool, appending additional data each time. Choose this option if you want to save the results of multiple invocations of a tool into a single file. Replace existing tab: EditPad will create a new tab to capture the tool's output, and replace that tab's contents whenever you run the tool again. Make this choice if the tool outputs too much information to neatly fit into the message pane, and you only want to keep the results of the last invocation of the tool. Mark the tab as "modified" if it contains data: Turn on this option if you usually want to save the captured output into a file. If you close the file without saving, EditPad Pro will prompt just like when you close an unsaved file. Turn off this option if you usually want to discard the output. Note that if you edit the output, the tab will still become marked as modified. Close the tab if it remains empty: This option is particularly handy when you've chosen the "into new tab" capturing option. It automatically closes the tab if nothing was captured, so your workspace doesn't get cluttered with empty tabs. File type for tab: Since standard output doesn't have a file name, EditPad Pro cannot use the file masks from the file type configuration to determine the output's file type. Therefore, you can select one of the file types from the list. Choose the "same as current file" option for text processing tools that return a modified version of the file you're editing. If you close the tab EditPad Pro is using to capture standard output while the tool is still running, the tool's output will be lost. However, the tool will keep running until normal completion. EditPad Pro will keep clearing the tool's standard output without saving it anywhere. Standard error works just like standard output. While standard output is intended for console applications to produce their output, standard error is intended for their error messages. Not all console applications respect this distinction. Some may send error messages to standard output. When the application is run from a command prompt with output appearing on the screen, standard output and error are automatically combined onto the single screen. This makes some programmers forget to make their console applications distinguish between standard output and error. Therefore, EditPad Pro offers the "combine with output" option. EditPad Pro will then mingle standard error with standard output, just like a console screen would. The combined output will end up in whichever location (tab or message pane) you selected for standard output. All the other choices for standard error are identical to those for standard output. If you select one of the three tab options for both standard output and standard error, you will get two new tabs: one for standard output, and one for standard error. Since EditPad Pro has only one message pane, the only way to capture both standard output and standard error into the message pane is by selecting the "message pane" option for standard output, and the "combine with output" option for standard error.